I'm back at it. 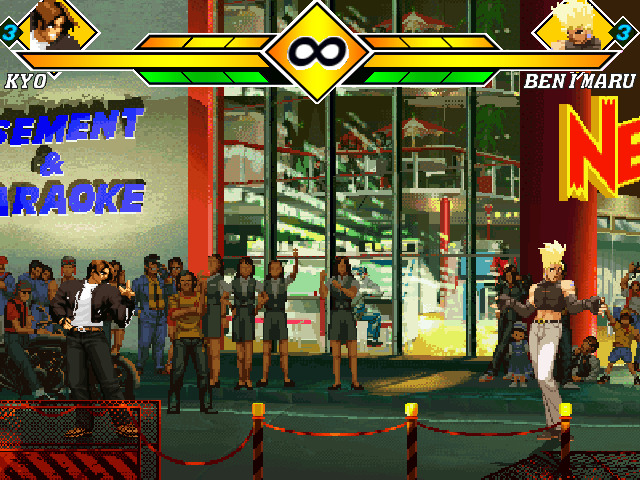 This time it's the KOF 95 Hero's stage. Now with superjump, it also has a custom looped track by yours truly and zoom (1.1). Thanks to Ryo2005 for the original stage. 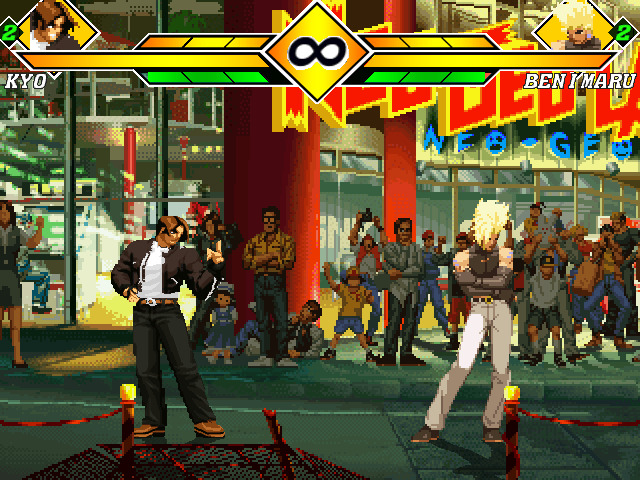 I intend to do all the KOF 95 stages, so be on the look out. Enjoy. nah, you're safe, it's neither 1 of those. you should remember tho, since i spoke on it some time ago back at HQ, lol. Alpyne_D wrote: nah, you're safe, it's neither 1 of those. you should remember tho, since i spoke on it some time ago back at HQ, lol. 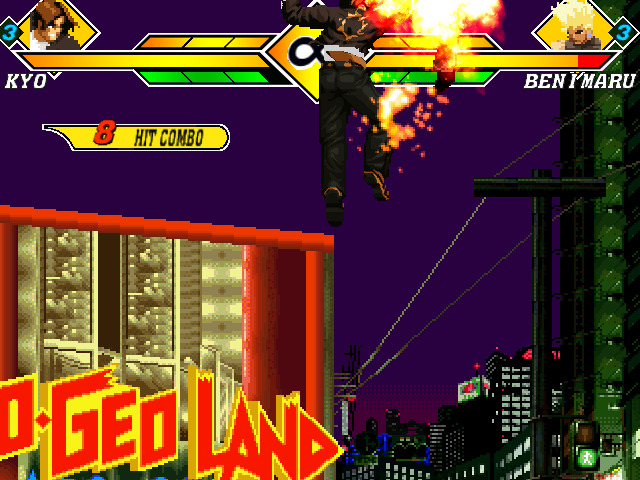 Always loved Neogeo Land. I think they layerno1 objects fit nicely too, all the animations look smooth and flow together nicely in game. So i enjoy those quit a bit. Bgm is nice too. - Uncropped sprites. It's one button, i can understand not doing it to keep some sprite pos's, there's some that can be cropped without that being an issue though. Regardless of how big the stage is or how little it effects the fps, it's always nice to crop. It's professional and it people with much slower systems than you will appreciate it. 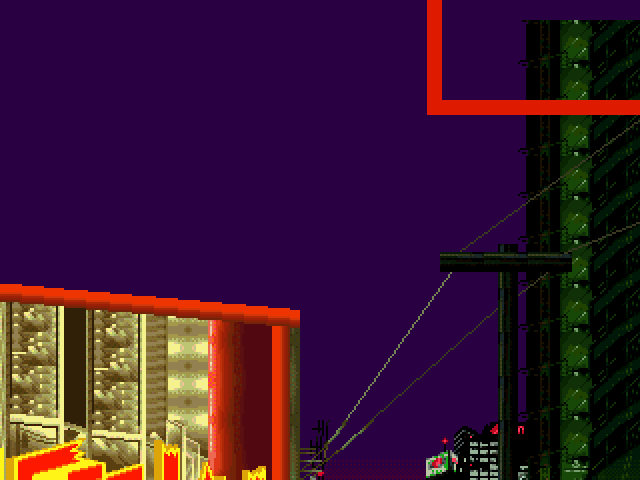 - This area within the red box shows the top of the building that really bugs me. It seems to just, cut off. Plus the sky all around it is one color, very bland. You should consider using a LR sky or even some stars or something to make it a bit more lively up there. Yo thanks bro. Great advice. I thought I fixed the bounds so that last screenshot wouldn't happen. I'll be sure to correct that. No problem, man. I look forward to the update. [You must be registered and logged in to see this link.] wrote: No problem, man. I look forward to the update. Yo! LilBro! Which version and what resolution are you using in screenshot you posted? The original version (not 1.1) and 640x480, shots a weird size since i edited it. [You must be registered and logged in to see this link.] wrote: The original version (not 1.1) and 640x480, shots a weird size since i edited it. I tested it(normal version) on 1.1 at 640x480. The bounds were good. I suspect it do the same on 1.0 I actuall didn't test it on Winmugen but it should work there as well. I tested it in 1.0, perhaps the deltas got a bit goof'd there or something, they shouldn't have though. Strange indeed. I need to test it on 1.0 perhaps.